This week I’m excited to introduce you to Ed Edmunds, a monster maker in Greeley Creative District, Colorado Certified. “Art” means an emotional experience to Ed. It can be lots of things – funny, scary, creepy, gross, weird. He doesn’t really care as long as it evokes some sort of emotion, and preferably a powerful emotion. In case you missed it, make sure to watch the making of this episode with Ed – Behind the scenes: Halloween props, masks and monsters with Ed Edmunds. As a child and fan of television shows such as The Outer Limits, The Time Machine and the original Star Trek, Ed enjoyed creating masks and putting on performances as monster characters. Continued experimentations with makeup turned his artistic hobby into a true talent at a young age, and among other stage makeup and prop work, he started his mask-making operation, Distortions Unlimited, while still in high school. 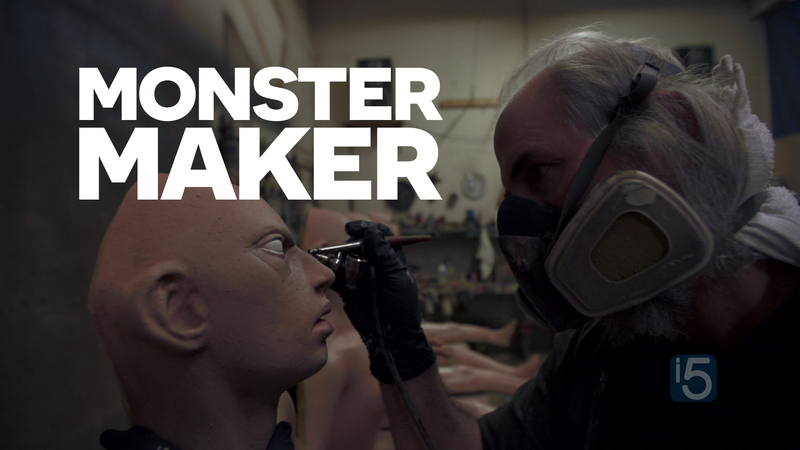 Now after more than 35 years, Ed and Marsha Edmunds, and their talented crew continue to make monsters. Their quality props, masks and creations have been a mainstay of the dark amusement industry since 1978. Long creative hours are spent in gray-walled offices with brain-eating hunchbacks, wall-scaling zombies and docile 3-foot tall aliens. The working environment looks more like a nightmare factory than a place of business. Do you aim to create an emotional experience for your audience? What kind of emotional experience? Consider commenting below with your thoughts.